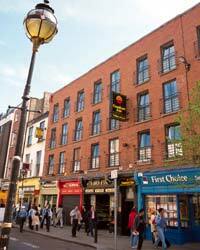 A popular and comfortable three star hotel The Comfort Inn is ideally located for the guest to enjoy all that Dublin has to offer. Offering good quality accommodation at affordable prices. The staff are very pleasant and highly trained and will do everything in their power to make sure that all guests have an enjoyable stay. The hotel offers comfortable and homely accommodation and make each guest feel special and well looked after. The en suite bedrooms contain all necessary facilities including satellite TV and ISDN lines. There is an elevator in the hotel and a child-minding service is available to ensure parents can have a worry free enjoyable night out. The Belvedere Bar in the hotel is a very popular venue for both locals and guests, with great music and a reasonably priced and tasty food menu. The Comfort Inn's is situated in a perfect location so the guest can choose between dining in the hotel's own restaurant or from one of the wide variety of restaurants in the area. Ideally located off Parnell Square at the end of O'Connell Street, the guest can explore everything that this wonderful city has to offer. The Gate Theatre, The Writers Museum, the James Joyce Centre and the Hugh Lane Gallery are all just minutes away. Temple Bar with its dynamic night life and Grafton street a wonderland of great shopping and free entertainment by the buskers are less than ten minutes away.